Classic Colonial House from "Planes, Trains, and Automobiles"
This classic red-brick house is the one that Steve Martin’s character Neal owned in the 1987 John Hughes comedy Planes, Trains and Automobiles. He spent most of the movie trying to get back to it in time for Thanksgiving. 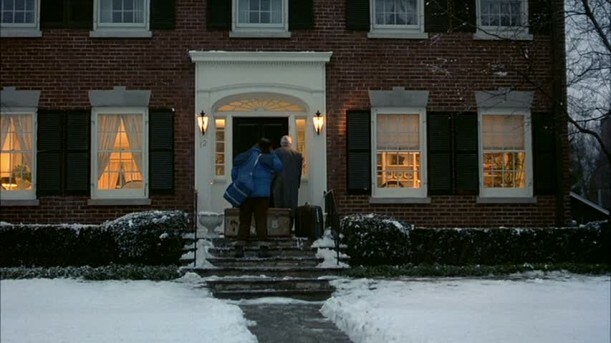 The house where it was filmed is in Kenilworth, Illinois. It’s on the market for $1.799 million, so let’s see how it looks today! 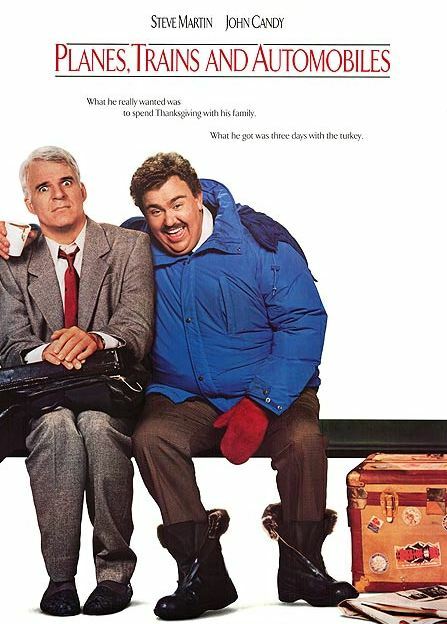 John Candy played Del in the movie, who ends up traveling with Neal. Interspersed with scenes of them being stranded in airports, sleeping in seedy motels (“those aren’t pillows!”), and watching their rental car go up in flames, we saw Neal’s wife and 3 kids back at the house, waiting for him to get home. 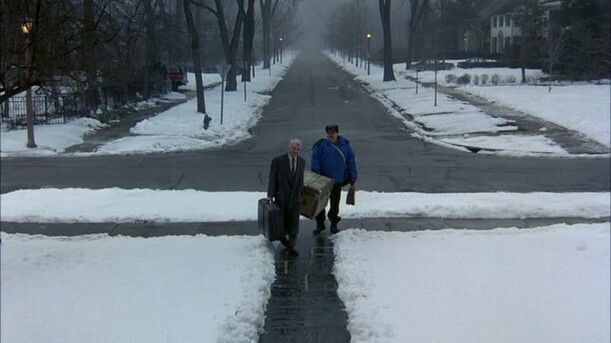 We only get a few glimpses inside the Planes, Trains and Automobiles house. So it surprised me to read on the IMDb website that 7 interior sets were built for Neal’s house. If they spent all the time and money on them, I wish they would have filmed more of the rooms for us! The house was built in 1916. For more photos and information, check the listing. 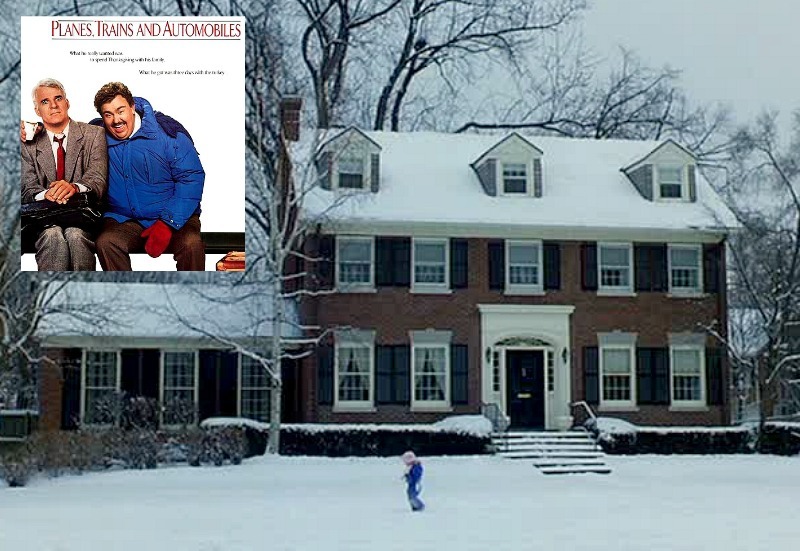 A lot of people have pointed out the similarities between the Planes, Trains and Automobiles house and the one from John Hughes’ classic comedy Home Alone, which was on the market recently, as well. Some have even asked if they’re the same house — but as you can see below, they’re different. It’s one of my favorite movie houses. You can see the (real) interior of the Home Alone house here. I grew up (and my parents still live) about 3 blocks from there. I remember the filming and them waiting and waiting for it to snow but it never did (which is odd because it snows a lot there in the winter!) and they had to truck it in. 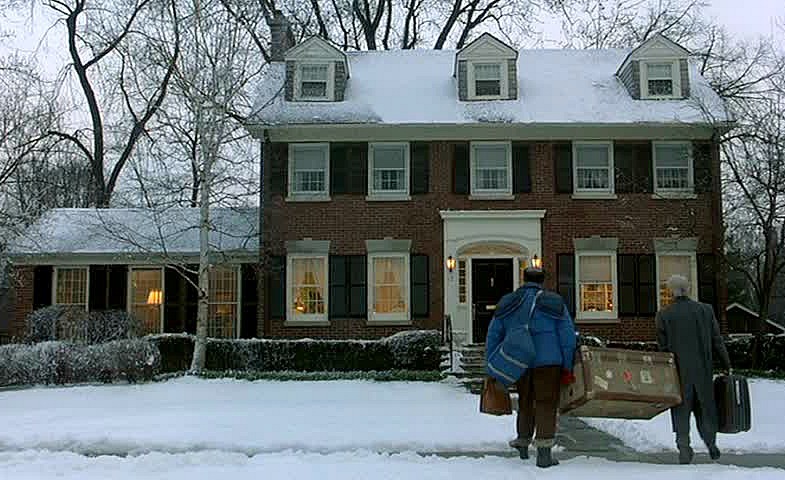 The “Home Alone” house is also close to there — the next suburb north — only a couple miles away. I love to google map these places. A lovely place to live. Don’t suppose your parents are in one of the gorgeous homes on Sheridan on the lake? The listing touts being close to the lake but is there access to the lake close by other than for those who live on it? Oh, yes, Ann. There’s lake access about 5 blocks from there. Just there last week and house still has a for sale sign up! 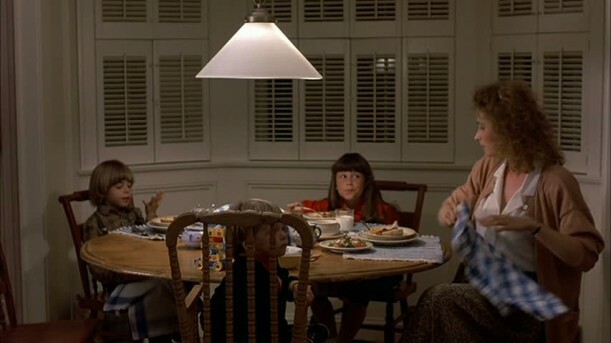 I have the same observation that I had of the original Home Alone house…Im a little surprised at the quality of interior trim work. I would expect a house that age to have more substantial crown moldings, casings, and wainscoting. But I love these classic “5 over 4 and a door” houses! John Hughes had excellent taste in real estate! I wonder how much of my own house taste was formed from watching his movies? I grew up not too far from the Home Alone House. My parents now live about two block from it. Kenilworth and Winnetka are two suburbs right next door to each other on the North Shore of Chicago. My great-grandparents lived in Kenilworth, so even though the house doesn’t do much for me I had to smile. The kitchen is huge and not very welcoming for my taste. I never saw the movie, but it’s a beautiful house. The center entryway and exterior are my favorites. The inside is a bit too grand for me. I love this house and this movie! The scene where they’re driving that burnt out car never gets old to me. John Candy was so funny! I always choke up when he finally gets home and it’s Thanksgiving–so cozy and inviting. I love on movie sets how they make it looked lived in. Did someone hang that scissor and bag there where she’s on the phone? I guess every house has homey clutter. As far as the movie house goes, I love it! Traditional in it’s purest form. Thanks Julia! P.S.– I am formerly Jodi from New Jersey. I have taken a leap out of my comfort zone and started a video blog (vlog) on You Tube as Screendoorgirl3. I’m also on Pinterest @ Screendoorgirl 3. Yikes! I’ve never seen the movie, but now I want to! 😉 LOVE the house, with the exception of the island in the kitchen. Not a fan of that. It has great bones! Something about our home reminded me of this house when we first walked in as we were looking for a home. Ours is a white clapboard, not brick but like this house, it just felt like home to me. The house is lovely, but I am not fond of the way it is decorated (in particular, the window treatments). It needs more color. I like the rug with the big flowers. We live in a smaller red brick colonial with black shutters and white trim, and I never get tired of it. So classic and beautiful! Great movie house! Those two were an incredible duo – miss John Candy so much! It’s wonderful to see the real house. What a nice house. I haven’t watched this movie, but it sounds fun. I love watching John Hughes movies because he always does a great job with the sets. Also because the plots and characters are fun. That house is a big, fat yuck-o. I don’t know how anyone could confuse it with the Home Alone house. 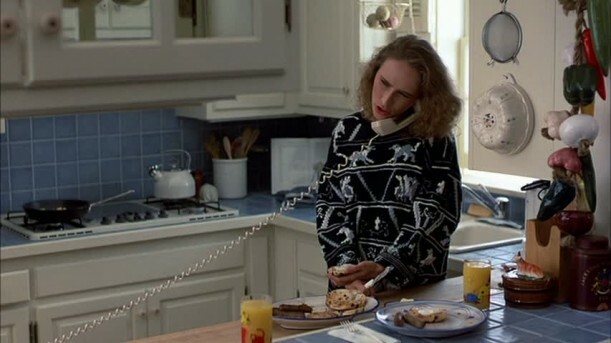 While the Home Alone house now looked dated of course, back in 1990 it was the cutting edge of home decor. While most people’s homes still reeked of 1970s brown or 80’s mauve and light blue, the Home Alone house came on the scene making decorating nuts like myself go crazy with envy. 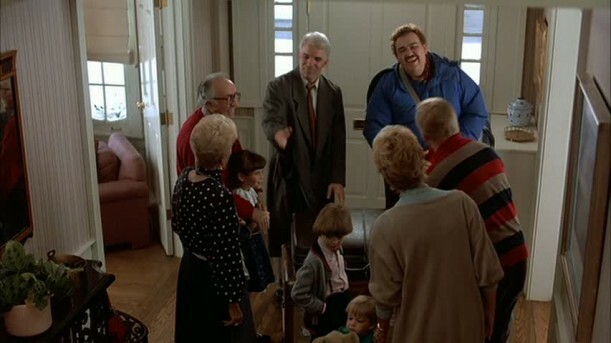 While I love the movie Planes, Trains and Automobiles, I have never had house envy. While the outside was beautiful, the brief scenes we get of the inside always seemed so blah to me. I always thought they could have done a better job with set design. The way the house looks now is pretty bad, imo. It looks like a mish mosh of every single decade. Old narrow rooms. Terrible textiles. Kitchen is every bit of 20 years old with that blonde wood. I’m usually not this harsh on a house but when a seller wants 1.79 million for a house in a down market, you need to be on the top of your game. I love the outside shot – with its gum drop trees! Well it’s charming on the outside. As someone already mentioned the dining room has light fixture envy, but the kitchen…well it’s a sad room where when the music stopped the cabinets all sat down around the edge of the room, except those two that were now left out in the middle like leftovers. Yes, like they ran out of cabinets so someone decided, what if we just angled them? You think anyone will notice we ran out? Hey maybe it will take away that structural beam cutting the room in half, yet off center above where we decided to place the focal point of the room stove. Yeah, I’m sure that will do it. I’d go back to the original home before what they have done. It definitely has a 90s vive going with the balloon tops in garden room, mixed dated color carpeting around and a dozen other era upgrades. And what is with the kitchen? Looks like they enlarged it, but haven’t done anything else since installing what looks like the “pink” glazed cabinets so popular back whhen and odd wallpaper trim. And what is with those drapes hanging on either side of the island? Must be hiding something which wasn’t resolved along with the support beams. I’m wondering if the original kitchen had a canning room or dual purpose laundry, mud room, pantry (butler ). Then there is the bath, cheap tile of some odd color and doesn’t match the walls. I feel like they really remuddled and in a very inexpensive way. So….give me back the original. Anyone buying this will gut again, too bad so much of the historical details are gone. Not normal for me to gripe, today is beautiful and waking up to a sunrise. I love the exterior, I was thinking it looked like the house in uncle buck with john candy. Although I haven’t watched that movie in years. I watched both movies over and over and I like the original style and interior of the houses, they are more homey than what they look like now from the pictures that you have given us to see. I think in years past the homes gave a warmer feeling to the interior of the rooms.